Recommended to: Readers who enjoy dark humor and aren't afraid of a little gore. Greg has just killed the man he hired to kill one of his wife’s many lovers. He’s now got a dead body in his office. Carlton, Greg’s brother, desperately needs a dead body. It’s kind of related to the lion corpse that he found in his basement. This is the normal part of the story. From Jeff Strand, the author of Benjamin’s Parasite, The Sinister Mr. Corpse, and Fangboy, comes a tale that’s weird even by his standards. This is my first DarkFuse book and I have to say, I really enjoyed it! Based on the synopsis I wasn't really sure what to expect, and I still can't quite do it justice except to say that it is great. 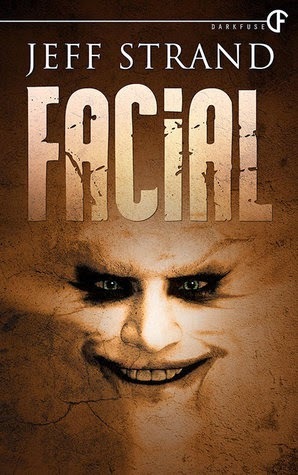 Facial is dark, and a bit graphic, but hilarious and witty too. At only 86 pages it is a quick read, but it is enough for this story. Not a lot of suspense or thrills, just matter-of-factly stated insights from the characters on their current predicament. If you enjoy books like John Dies at the End that are a little unorthodox then this book is highly recommended.